Attention all Gear Head Blue Blazer members and auxiliary trainees, all points bulletin, we've got the first of our "Hey, we've got new uniforms so we made a awesome video about it." It's from Norman Freaking Oklahoma. I believe we've got a narrative we're trying REALLY hard to craft. Oklahoma is like a piece of wood. Oh and the Rough Riders. And a wagon. Also we're going to deduct points from the video due the failure of the video to actually, you know, show the uniforms. For my money any Rough Riders reference that doesn't include a lil DMX is utterly pointless. These are the ALTERNATE unis. OU is quick to point that out. Nike would like you to believe that they are distinctly OU with a nod to the rich heritage of Switzer, Wilkinson, et al. Fun fact...did you know the Rough Rider story is largely mythology? Sorry to break it to you. For one they had to leave their horses in Florida due to transportation issues. Who hasn't run into that issue when you're heading off to fight the Spaniards? They also out numbered the Spanish 15-1, but hey, the moral there is don't go picking on the guy who's got 14 horseless friends. They also never charged up San Juan Hill. They walked. Up Kettle Hill. Other than that, dead on. Nike is going to tell you that these tell the story of OU football. The template apparently tells the story of Washington football as well. Or a splinter of wood. The wood thing is lost on me. Did I miss something here? I get the idea that the Sooner Schooner is made of wood, but since when did OU start identifying with stumps? Oh wait, it's a mythology! And fabricated mythology at that. Well done Nike, you're doing a bit and you've convinced some SID or associate AD that this is AWESOME. It's a stump. It has NOTHING to do with Bud Wilkinson or Billy Simms or Jason freaking White. 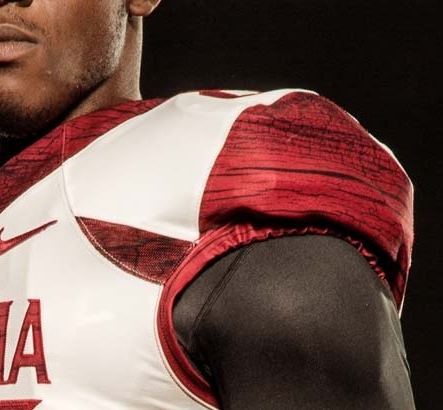 Let's be honest, OU and Washington are just the first schools to publicly come out with the new Nike Template. You'll see it every where. 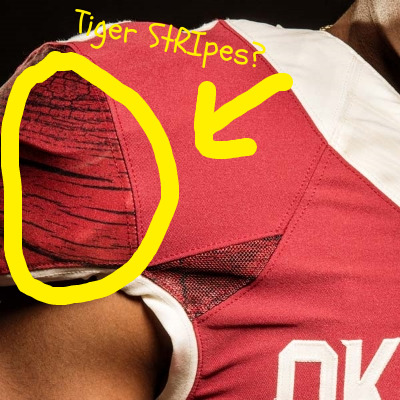 While we're at it, those look A LOT like tiger stripes a la the Cincinnati Bengals. But never mind, let's mainline the Kool-aid, "those are wood rings, synonymous with Sooner Football!" Yep, I had no idea either. Let's get Wiki to figure it out. Anthracite (Greek ἀνθρακίτης (anthrakítes), "coal-like," from ἄνθραξ (ánthrax), coal) is a hard, compact variety of mineral coal that has a high luster. It has the highest carbon content, the fewest impurities, and the highest calorific content of all types of coal, which also include bituminous coal and lignite. 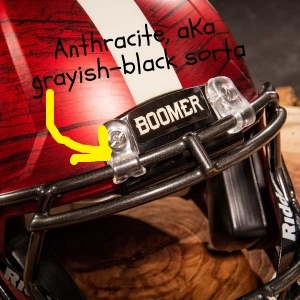 According to the OU uniform site that you can find here..."Anthracite facemasks harken to the Rough Riders of the late 19th century." Yep me neither. Look kids, it comes in white! The Gear Head Czar may not make August if this keeps up. Thankfully these are alternates so we won't have to see them except for once or twice a year, but it's a slippery slope OU. Very slippery. Let’s get all retro and what-not. Let’s go back to 1998. Sort of. War Owls, sleeve stripes, and raggedy Mustangs. Have them sit on rocks for the photo shoot. Posted on July 2, 2014 by Sure Bud and filed under Southwest Round-Up and tagged Gear Head Oklahoma Sooners Nike Uniforms.